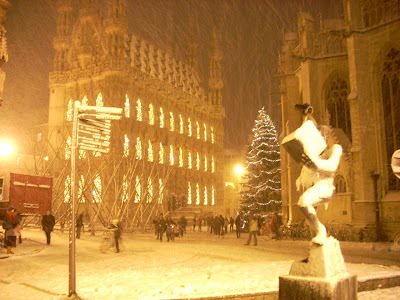 No palm trees, no beaches with white sand, no tropical temperatures… my Erasmus stay in Leuven was not exactly what you would call an exotic trip, but it was definitely a different experience from what I am used to and I really enjoyed the time I spent there. 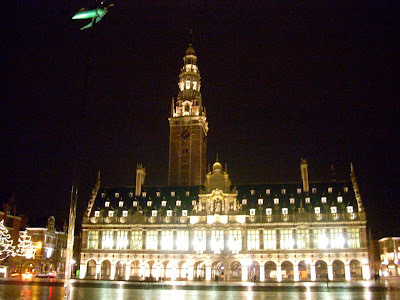 In the following few paragraphs I will attempt to summarize this amazing term in Flanders. I only had 10 hours of lectures, which was not a lot compared to what we usually have in Namur, but – believe me – it did not mean that we had less work… I took four courses: three in English and one in Dutch. First, Literature, Religion and Art in Europe: an interdisciplinary approach was a course that is part of the PECS programme, a series of courses targeted at students from abroad. The first part of the course was dedicated to religious paintings throughout centuries. Then we took a bird’s-eye view of the best-known paintings in European history. Later on we looked at the different genres of paintings, as well as the techniques that were used to make colours throughout history, and finally we analyzed the political aspects of a selection of paintings and texts. As part of the exam we had to write a paper on a topic of our choice, as long as it dealt with the broad topic of ‘art’ – obviously. In my essay I discussed “the Evolution of Still life painting from the Antiquity to present-day”. Do not ask me why I chose this topic: I knew absolutely nothing about this genre before writing this paper and do not find this kind of paintings really beautiful, although I admit it was great fun to write this essay. The written exam dealt with paintings analyzed in class. Second, I also took a couse called Engelse Literatuur II: Engelstalige literatuur van 1800 tot heden. The course was divided in five parts. We analysed poems and prose texts dealing with Revolution & Reform, War, Class, Gender and Empire. The oral exam consisted in two parts: a presentation on a poem not seen during the lessons and a question about a poem dealt with in class. Third, the last course in English was Grammar and Diachrony. During the lessons we were divided into small groups and had to find answers to questions on a scholarly article on diachronic linguistics that we had to read in advance. At the end of each lesson we had to present our answers to the whole class. Finally, the Dutch course I took was Kennismaking met de Spaanstalige wereld, which was divided into two parts: the history of Spain, and the history of its former colonies in Latin America. The written exam basically consisted in a series of questions that you could only answered if you knew the course really well. The organization of the K.U.Leuven regarding Erasmus students is really efficient. I received fully detailed brochures with all the information I needed about my stay in Leuven during the Summer holidays. As for the accommodation I went to Leuven around 20 August and I got a rather long list of student rooms available for the first term of the academic year and I found one that suited me very easily. Moreover, we were given all kinds of useful documents, and the Toledo platform proved to be very efficient in transmitting information. My room was situated in the Justus Lipsiusstraat: a street just in the middle of a neighbourhood awkwardly combining a secondary school, the women’s prison (just in front of a wall on which a tag read ‘Cipiers zijn rotzakken’), a cigar factory (which often produced a strong smell of vanilla), and the University. My nine flatmates were really friendly and kind with me. They already knew each other for two or more years, but they did everything to make me feel part of their group. Most of them studied law and psychology, and one of them was an Erasmus student from Germany, so I have also been able improve my German during my five months’ stay in Leuven. During the semester we organized several dinners with my flatmates and went out together a couple of times as well. 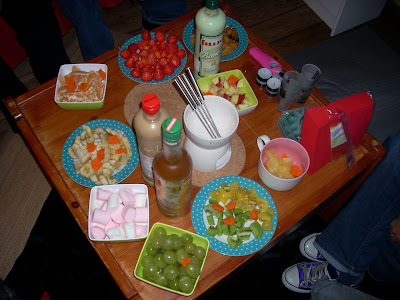 I really enjoyed this ‘gezellige’ atmosphere I lived in with my flatmates. My student room was located at a stone’s throw from the main shopping streets of Leuven, which is an advantage when you are a girl. I definitely recommend you the Bondgenootenlaan and the Diestsestraat, where you can find plenty of shops such as the famous Zara and H&M. My favourite place to drink a coffee was the Punto Caffè where I often took a Bounce Coffee to go: a mix of coffee, milk, white chocolate and cream: Verrrrrukelijk. I must admit that the sandwiches were quite small in comparison to those in Namur (and I was very much disappointing to find out that there were no equivalent to Ursule & Petula, although some sales assistants were serving food as slowly), although a place called Bocata proposed some good sandwiches such as one which made with ham, parmesan cheese and vinaigrette or another with tortilla. Gezelligheid, new friends and hard work are definitely three elements that would perfectly summarize my experience in Leuven.